On the birth of their first grandchild, John and Collette Leenman began to worry more about what kind of world they would leave behind for him. At their home in Puriri Valley, they already did small things like recycling and reusable shopping bags, but it didn’t seem like enough. When the Leenmans retired from Auckland, their aim was to buy a place in Thames and ride bicycles everywhere. When they couldn’t find the right house and ended up a little way out of town, they didn’t feel good about using so much petrol driving back and forth. That’s why when they wanted to replace their car they looked into electric models. Buying a new EV seemed beyond their means, but when they discovered that used EVs were affordable, they didn’t hesitate. Now, for the Leenmans their Nissan Leaf isn’t just a sustainable driving option, it’s also a lot of fun. Better still, the Leenmans’ home is partly run on solar power, which makes home-charging their EV even more sustainable, not to mention cheaper. The Leenmans have been driving their Leaf for over a year now, and still get a kick out of it. With their home power boosted by solar, in 20,000km of driving they estimate they’ve saved $3,000 to $4,000. But it’s not just the savings. Taking that interest seriously, the Leenmans have organised events where people can come and take test drives. They found that people get more enthusiastic about EVs once they’ve had a go, and misconceptions can be corrected too, including ‘range anxiety’. “People are surprised at the Leaf’s range. They ask how far it will go, thinking the answer is about 10km, and they’re amazed when we say 150km. They’re also surprised at the price – one women thought they were $90K!” laughs John. Other misconceptions are that the battery doesn’t last long, and is an environmental issue when it needs replacing. The Leenmans are quick to assured people that their own battery has still 98% capacity after 20,000km of driving, and old batteries are recycled. They also point out that 80% of NZ electricity is generated by renewable energy, and that’s why electric cars are such a good idea for the country. 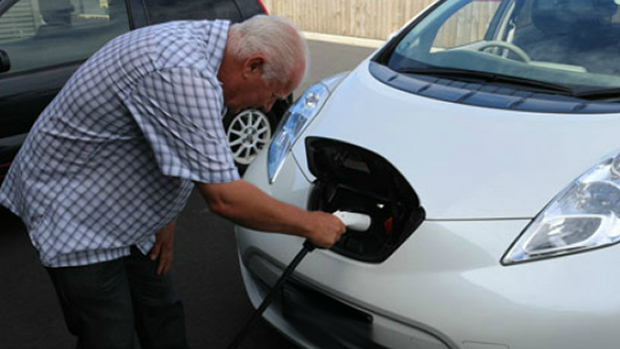 John is a great ambassador for EVs in the Coromandel, handing out pamphlets to business: “Getting your business ready for electric vehicles.” A number of public charging stations have been added to the network, including one at the Kopu Café, and a Blue Commando at a Thames motel. PlugShare lists three charge sites in Coromandel township, and once ChargeNet installs its fast charger in Thames John reckons that will tip the balance in the region. John and Collette have faced their own range anxiety, turning it into a spirit of adventure. In their travels, they’ve discovered a lot of campgrounds that are eager to include an EV charger to their list of amenities. “Any range anxiety we have left is a small price to pay for knowing we’re saving the planet,” says John.